The Unyon ng mga Manggagawa sa Agrikultura (UMA) today predicted that the Duterte government would never provide justice to the victims of the Hacienda Luisita massacre. Even if supposedly, it blames the yellows such as former President BS Aquino as its arch enemies. In fact, it is preparing for the reversal of the decisions made by former DAR Secretary Rafael “Ka Paeng” Mariano with regards to the land disputes there and in other parts of the country. In the very day of the anniversary of the Hacienda Luisita massacre on November 16, and on the following day, the new leadership of DAR with Duterte’s blessings would conduct a forum to make it easier for landlords to evade agrarian reform through land use conversions. Said aims is the opposite of what the Presidential Agrarian Reform Council (PARC), which includes President Duterte, agreed to in September 2016 for a two-year moratorium for conversion of agricultural lands. The President, however, never signed an Executive Order (EO), for it to be binding. He then agreed for the rejection of Ka Paeng as DAR secretary. In essence the aims of the new DAR forum threaten Ka Paeng’s revocation order. This involves 384.12 hectares of land in the RCBC compound that was never converted to non-agricultural use for a period of more than 5 years when the previous DAR agreed to its conversion into industrial and commercial use. Ka Paeng then revoked Hacienda Luisita Inc. (HLI) conversion order. HLI used to own the 500 hectares of land which includes those that were revoked. Said company then sold these to RCBC, Luisita Realty Corp. (now Luisita Land Corp.) and to Luisita Industrial Park Corp. (LIPCO), for P4 billion, and owes the farmworkers P1.33 billion as their share as previous stockholders. It also threatens to reverse Ka Paeng’s junking of the appeal of Tarlac Development Corp. (TADECO) to exempt 358 has. of lands from land reform as the Cojuangco-Aquinos, who own said company applied for its conversion into industrial use. Other than these two properties, an additional 600 plus hectares of agricultural land still held by various companies of the Cojuangco-Aquinos including that of the Central Azucarera de Tarlac (CAT), with the Lorenzos as new co-owners, would be easily converted into other use. There can be no justice for the massacre of agricultural workers when the President is pro-landlord like the people he supposedly detests, the Cojuangcos and Aquinos. Alyansa ng Manggagawang Bukid sa Asyenda Luisita (AMBALA) today issued an eviction notice on the 500 hectare RCBC compound in Hacienda Luisita. According to John Milton “Butch” Lozande, secretary general of UMA, said eviction order was made as the new Department of Agrarian Reform (DAR) is preparing the grounds for the reversal of the revocation order issued by former DAR Sec. Rafael “Ka Paeng”Mariano on February 23, 2017. AMBALA is a member of UMA. The new DAR leadership will conduct a two day National Stakeholders Forum on Land Use Conversion on Nov. 16 – 17 in Microtel, UP Technohub. This forum aims to “harmonize and hasten the processes, procedures, guidelines, documentary requirements, and timelines of different agencies, with respect to the issuances of clearances which are required by DAR to properly treat an application for land use conversion or exemption from agrarian reform coverage. In essence this threatens Ka Paeng’s revocation order. This involves 384.12 hectares of land in the RCBC compound that was never converted to non-agricultural use for a period of more than 5 years when the previous DAR agreed to its conversion into industrial and commercial use. Ka Paeng then revoked Hacienda Luisita Inc. (HLI) conversion order. Said aims is the opposite of what the Presidential Agrarian Reform Council (PARC), which includes President Duterte, agreed to in September 2016 for a two-year moratorium for conversion of agricultural lands. The President, however, never signed an Executive Order (EO), for it to be binding. This also shows President Duterte’s true colors. He was never against the oligarchs, which includes the Cojuangcos, Aquinos, and Lorenzos who own Hacienda Luisita. He is just full of bluster and nothing more. Mothers and Relatives against Tyranny and Repression or MARTYR, an organization of kin of victims of the Hacienda Luisita massacre and other related killings, gathered in Tarlac last April 21. The Hacienda Luisita massacre occurred in 2004, leaving 7 farm workers killed and hundreds wounded. Survivors and kin of victims filed a case against the Cojuangco-Aquino owners of the estate, including Noynoy Aquino who was then a congressman, officials of the Department of Labor, and several PNP and AFP armed personnel. Unfortunately, accused personnel were given only minor administrative sanctions. Aquino who was earlier cleared from the case, practically “killed” the massacre case during his reign as President. The Ombudsman dropped charges against police and military personnel in 2010, while an appeal by the victims’ families was junked in 2014. Emy Ladera-Facunla, acting spokesperson of MARTYR, lamented that justice remains elusive after more than 12 years. No one was punished. More injustice was shouldered by farmworkers and the families of the victims with maneuvers of the Cojuangco-Aquino to circumvent the SC decision. Facunla is the sister of Abel Ladera, a Tarlac City councilor vocal against injustices perpetrated by the Cojuangco-Aquinos. Ladera was shot and killed by unknown assailants in 2005. “Our resolve to launch the bungkalan, or land cultivation initiatives in Hacienda Luisita is part of our quest for justice,” said Facunla who noted that the Cojuangco-Aquinos are still in direct control of more than a thousand hectares of land in Hacienda Luisita, aside from the more than 4,000 hectares supposedly allocated to land reform beneficiaries. Last February, The Department of Agrarian Reform (DAR) issued a partial revocation of the land conversion order for a 500-hectare property made idle by RCBC, LIPCO and Luisita Land Co. (formerly Luisita Realty Corp.) since 1996. “These lands should be rightfully returned to farmers to till. We are one with the struggle for land rights for the Hacienda Luisita farm workers no matter how long does it takes” said Erwin Laza, brother of Jesus Laza, one of the victims of Hacienda Luisita massacre. Laza said that most land reform beneficiaries in Luisita have become victims of the illicit aryendo or leaseback scheme. MARTYR is one with farmworkers’ organizations in calling for free land distribution. “This land was already paid for by sweat and blood of generations of farmworkers and our martyrs. The best way to honor them is to fight for genuine land reform. We must till and make the land productive for the benefit of the people and future generations,” said Laza. The victims of the Hacienda Luisita massacre were Jesus Laza, Jaime Fastidio, Jessie Valdez, Adriano Caballero Jr, Jhaivie Basilio, Jhune David and Juancho Sanchez. After the massacre, other leaders and advocates of the Luisita struggle were killed and forcibly disappeared. They are Marcelino Beltran, Abel Ladera, Fr. William Tadena, Ricardo Ramos, Tirso Cruz, Ronald Intal (desparecido) and Bishop Alberto Ramento. MARTYR members also include kin of activists who died in the course of the struggle due to sickness and other causes. TARLAC CITY, NOVEMBER 16 — The Unyon ng mga Manggagawa sa Agrikultura (UMA), Alyansa ng Manggagawang Bukid sa Asyenda Luisita (AMBALA), Kilusang Magbubukid ng Pilipinas (KMP) and Anakpawis Partylist led more than a thousand farm workers of Hacienda Luisita and their supporters from various sectoral groups from Central Luzon and Metro Manila in a mass action in front of the Central Azucarera de Tarlac (CAT) to commemorate the 12th anniversary of the infamous Hacienda Luisita massacre. On November 16, 2004, ten days after the United Luisita Workers Union (ULWU) and the Central Azucarera de Tarlac Labor Union (CATLU) launched a massive strike, a bloody dispersal was carried out by the military and police, killing seven farm workers and injuring more than a hundred others. The newly-formed Tanghalang Balen ning Luisita (Luisita People’s Theater) or TABLU, a group of young cultural activists from Hacienda Luisita and neighboring towns in Tarlac, led artists, cultural groups and activists in mounting a theatrical reenactment in front of the CAT sugar mill’s Gate 1, the actual site of the Hacienda Luisita massacre. The reenactment paid tribute to the life and struggle of Jessie Valdez, Adriano Caballero Jr, Jaime Fastidio, Jesus Laza, Juancho Sanchez, Jhaivie Basilio and Jhune David – the seven martyrs of the Hacienda Luisita massacre. The performance is inspired by the militant tradition of sugar workers in Escalante, Negros Occidental, where a reenactment of the Escalante Massacre is performed yearly by the community with the vow to carry on the struggle against state repression and fascism and for genuine land reform. Cultural workers and prominent artists have been collaborating with TABLU in creative workshops and political discussions to prepare for this production. Among the artists involved in the Luisita massacre reenactment are choreographers Edwin Quinsayas and Joanna Lerio; visual artists Leeroy New and Antares Bartolome for production design; composer Edge Uyanguren, his band TUBAW and Tambol Bayan, a Tarlac City-based group of very young percussionists founded by Nick Sangil, for sound and music; and other artists from Sinagbayan, Sining Kadamay and the Concerned Artists of the Philippines (CAP). Theater veteran Katsch Catoy directs the production. The activity was the culmination of a three-day people’s cultural caravan from Metro Manila to Tarlac which carried the theme “land, justice and peace,” highlighting the continuing demand of Luisita farm workers for genuine land reform in the vast Tarlac sugar estate, their call to finally bring to justice the perpetrators of the massacre, and their support for the ongoing peace talks between the government and the National Democratic Front of the Philippines (NDFP). “Twelve years have passed and the families of the victims continue to mourn and are still very much indignant as justice remains elusive. The perpetrators are not only left unpunished but are in fact being promoted to higher ranks,” UMA secretary general Danilo Ramos said, refering to, among others, current AFP Chief of Staff General Ricardo Visaya who was one of the field commanders during the massacre. “Noynoy Aquino himself who at the time of the massacre was a Tarlac solon and was very much involved in the affairs of his family’s hacienda and sugar mill, got away with not having to face prosecution and even went on to become the highest official of the land,” Ramos said. According to AMBALA, Aquino, allegedly in cahoots with the previous Department of Agrarian Reform (DAR) secretary Virgilio Delos Reyes, effectively ensured that Hacienda Luisita remained in the control of the Cojuangco-Aquinos while cleverly making it appear that the government was implementing the 2012 Supreme Court decision to distribute Hacienda Luisita to the farm workers. Mendoza also said that while they welcome recent statements made by present DAR Secretary Rafael Mariano regarding his current efforts to rectify his predecessor’s actions or to invalidate the so-called “tambiolo land reform” in Hacienda Luisita, the farm workers will continue to hold mass mobilizations, physically assert their claim on the lands and persevere in their collective tillage campaign or bungkalan. Anakpawis Partylist Rep. Ariel Casilao, who joined Luisita farmers in a solidarity activity last night in Barangay Mabilog, for his part said that landlessness, feudal exploitation, wage slavery, and other social and economic conditions that invariably lead to tragic episodes like the Hacienda Lusita massacre are still pervasive and are also the main causes of the continuing armed conflict in the country. “Hacienda Luisita is a classic, living case study to prove the need for genuine land reform and national industrialization, for thoroughgoing social and economic reforms which is in fact one of the main concerns of the ongoing peace talks between the government and the NDFP,” Casilao said. 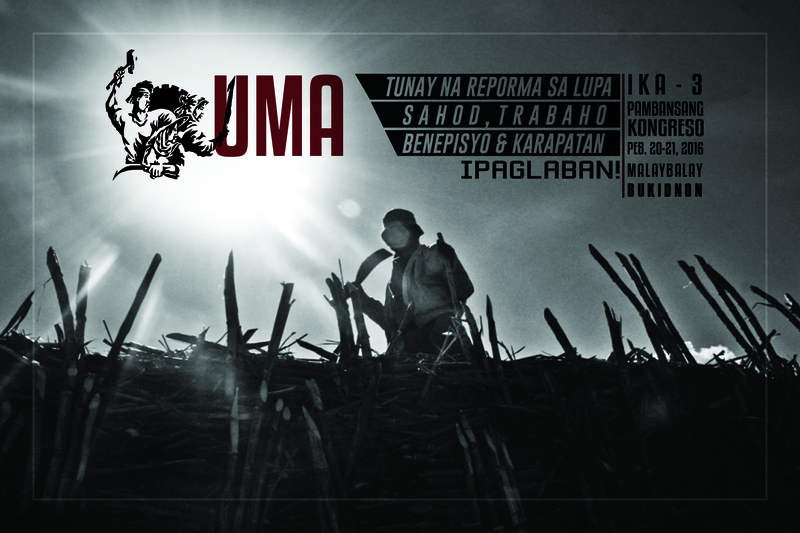 UMA member unions and organizations mark November 16 as National Day of Protest of Farm and Agricultural Workers. The International League of People’s Struggle (ILPS) Workers Commission has also declared this day as International Day of Action Against Trade Union Repression. UMA is a member of the ILPS. Hacienda Luisita “bungkalan.” Photos by Kathy Yamzon (BAYAN NCR). TARLAC CITY, NOVEMBER 15 — Large contingents of agrarian reform activists, human rights groups, church people, peace advocates, artists and cultural workers joined a caravan to different barangay of Hacienda Luisita in Tarlac province today, to commemorate the 12th anniversary of the Hacienda Luisita massacre. The caravan, dubbed #RememberLuisita, People’s Cultural Caravan for Land, Justice and Peace, is on its second day. Today, the supporters of Hacienda Luisita farmworkers will join the locals in the “bungkalan,” the land cultivation campaign initiated by the Alyansa ng mga Manggagawang Bukid sa Asyenda Luisita (AMBALA) during the height of the Welgang Bayan (People’s Strike) in 2004. The national agriworkers center, Unyon ng mga Manggagawa sa Agrikultura (UMA), meanwhile condemned former President Benigno S. Aquino III for vicious attacks against the farmworkers’ bungkalan during his 6-year term. UMA Secretary General Danilo Ramos stressed that the bungkalan still thrives despite relentless attacks unleashed by the Cojuangco-Aquinos. “The fake land distribution scheme via tambiolo, bulldozing of farmers’crops and eviction of farmers through burning and demolition of huts almost eradicated the bungkalan. But Luisita farmworkers refused to give up. Today, AMBALA strives to expand the bungkalan initiative through unity and cooperation among farmworkers,” added Ramos. UMA and AMBALA is calling on the Duterte administration to bring justice to the victims of the massacre which occurred 12 years ago, on November 16, 2004. Ramos also expressed alarm over the recent spate of killings and harassment of farmers perpetrated by private goons and state forces. Some incidents were reported to be under the guise of Duterte’s anti-drug campaign. “Peasant killings must stop,” Ramos stressed. The past week, farmworkers reported that an armored personnel carrier (APC) was seen roving around the bungkalan area in Barangay Balete, Hacienda Luisita. Ramos said that farmworkers have been clamoring for the complete pull-out of military and paramilitary troops in Hacienda Luisita. The company headquarters of the 31st Infantry Battalion, 3rd Mechanized Division is located right smack in the land reform area in Barangay Balete. Ramos also scored BS Aquino for junking of charges against the perpetrators of the Hacienda Luisita massacre. A few months after former President BS Aquino assumed office, the Ombudsman silently junked the case against police and military respondents involved in the massacre, thereby closing all pending cases against alleged perpetrators. The Ombudsman ruling was released in December 2010. The Ombudsman’s Military and Law Enforcement Offices (MOLEO) based its decision solely on NBI reports. Ironically, the particular NBI report states that there is basis to file charges against erring officials and that the testimonies of the survivors and protesters were more credible than that of the involved government personnel. The farmers’ complaints were junked without any other effort to conduct hearings or a more thorough investigation. One independent eyewitness cited in the report, made by Dr. Restituto Bauvacieda Jr., then a city health physician and member of the emergency response unit of Tarlac City, was quoted as having witnessed a man wearing civilian clothes firing at the direction of the protesters, while he was inside the fence under the control of the Central de Azucarera de Tarlac (CAT). This is an indication that elements of the yellow army or even then Congressman BS Aquino were directly involved in carrying out the massacre. In August 2014, still under the term of BS Aquino, survivors and relatives of the victims filed a motion to reopen the case. The motion was junked only a few months later in October. The said NBI report on Hacienda Luisita only became public in November 2014, ten years after the massacre. By that time, the Ombudsman already junked the motion to reopen the case. Farmers vow to revive their complaints as they hope that the Duterte administration would be keen in dispensing justice for the victims of the massacre and other crimes committed thereafter such as the string of extra-judicial killings and the recent atrocities by the BS Aquino regime, including bulldozing of crops, burning of huts, physical injuries and illegal arrests. Another violent incident involving Cojuangco-Aquino goons occurred last July 1, during the very first day in office of President Duterte. UMA has declared November 16 as a National Day of Protest of Farm and Agricultural Workers, while the Workers International Struggle Initiatives (WORKINS) has declared it as the International Day against Trade Union Repression. A theatrical reenactment of the Luisita massacre will be presented at the actual site of the carnage, in front of the Gate 1 of Central Azucarera de Tarlac tomorrow, November 16, the 12th anniversary of the Hacienda Luisita massacre. NOVEMBER 14 — Since last week, a group of young cultural activists have made Hacienda Luisita farmworkers go out of their way to watch performances mounted at busy side streets and basketball courts in different barangays within the sugar estate. With familiar protest songs, some cardboard and bamboo props – and grit – members of the newly-formed group who call themselves TABLU or Tanghalang Balen Ning Luisita (People’s Theater of Luisita), created a short street play depicting the life and death struggle of farmworkers in Hacienda Luisita. Mothers and relatives of those who offered their lives to the struggle could not help but weep and rage after watching TABLU’s skit. “Tuloy ang laban! (Onward with the struggle! ),” they declare. “Let us remember the sacrifice of our martyrs and carry on with the struggle,” another performer emphasizes. After all, the farmworkers’ quest for genuine land reform and justice is truly far from over. This year, the commemoration of the Hacienda Luisita massacre will take the form of a 3-day “People’s Cultural Caravan for Land, Justice, and Peace.” National agriworkers center Unyon ng mga Manggagawa sa Agrikultura (UMA), their local affiliate in Tarlac, Alyansa ng mga Manggagawang Bukid sa Asyenda Luisita (AMBALA), and the network of land reform advocates Luisita Watch, will lead the caravan in coordination with various artists, musicians and cultural groups. Participants of the caravan assembles early this morning in front of the Department of Agrarian Reform (DAR) in Quezon City where an opening program will be held. Street performances and short programs will also be held in brief stops in Balagtas and Malolos City in Bulacan and in Angeles City in Pampanga. Sining Kadamay, Salinlahi Collective and the UP Repertory Company will perform. A group of visual artists led by the Ugatlahi Collective and painters from the UP College of Fine Arts will also join the caravan. The caravan will then pass through Capas town and San Miguel, Tarlac City where peasants, indigenous peoples and the farmworkers’ contingent from Hacienda Luisita will meet the caravan participants. A “Konsyertong Bayan” or concert for Land, Justice and Peace will be held at the Maria Cristina Park, near the Provincial Capitol. The concert will feature progressive musicians and bands such as the homegrown Tambol Bayan, a group of young percussionists from Tarlac City. Tambol Bayan has been “touring” Hacienda Luisita barangays along with TABLU. Manila-based groups such as Tubaw, Talahib, Gazera, Exsenadors and Karl Ramirez at ang Pordalab will also perform at the Konsyertong Bayan tonight. Inspired by the militant tradition of sugar workers in Escalante, Negros Occidental, a theatrical reenactment will be mounted in front of the Central Azucarera de Tarlac Gate 1 on November 16, the actual anniversary of the Hacienda Luisita massacre. Cultural workers and artists have been collaborating with TABLU in creative workshops and political discussions to prepare for this production. Among the artists involved in the Luisita massacre reenactment are choreographers Edwin Quinsayas of Sining Kadamay, and Joanna Lerio; visual artists Leeroy New and Antares Bartolome; composer Edge Uyanguren and his band TUBAW, and other artists from the Concerned Artists of the Philippines (CAP). Theater veteran Katsch Catoy directs the production. UMA Secretary General Danilo Ramos meanwhile stated that there has been no justice for those killed and wounded in the Luisita massacre and in subsequent incidents of extra-judicial killings and enforced disappearances after the massacre. “Some of the massacre perpetrators were even promoted and held the highest positions in government” Ramos said. He cited former President Benigno S. Aquino III, whose clan controls the Hacienda, and two AFP Chiefs, namely Gen. Gregorio Catapang and incumbent chief Gen. Ricardo Visaya, who were both at the “ground command” when the massacre occurred 12 years ago. “Implementation of land reform through the lottery or ‘tambiolo’ scheme victimized those who had been tilling the land since 2005. The scheme was designed to reconcente lands back to the control of the Cojuangco-Aquinos. It also excluded more than 1,000 hectares of land for distribution,” Ramos added. The so-called land reform area in Hacienda Luisita is back in the hands of the Cojuangco-Aquinos through the illicit aryendo and sale of farmlots, complemented by forced and violent eviction of farmworkers in bungkalan areas and the destruction of their crops. “To boast that they are still in control, Cojuangco-Aquino goons were again involved in one instance of destruction of crops in Brgy. Mapalacsiao which occurred on the very first day of the Duterte presidency on July 1,” said Ramos. He added that the saga of farmworkers offer firm lessons from a real-life drama which inspire people to work for a better country and society. “Farmers are still clamoring for land, justice and peace. These can only be achieved in Hacienda Luisita and the rest of the country after genuine land reform and social justice is realized,” he ended. Portraits of the seven martyrs of the Hacienda Luisita massacre by Renan Ortiz. OCTOBER 1, 2016 — In a moving testimony, Bernardina Bais recounted one misfortune after another since Hacienda Luisita was subjected to so-called “land distribution” under former President BS Aquino. A video of a distraught “Apong Dina” recently went viral online – she was crying her heart out as local policemen assisted in another attempt to drive them away from the land they have been tilling for more than a decade. Her husband, Gerry Catalan, was among those unlawfully arrested, detained and charged by DAR personnel in 2014. Their crops were repeatedly destroyed by Cojuangco-Aquino goons since then. “In the latest incident, our hut was partially demolished, and our crops were sprayed with herbicide. But we refused to give up,” Apong Dina said. During that time, “turn-over ceremonies” were ongoing at the DAR compound in Quezon City. “Goons attacked our bungkalan (land cultivation) areas on Ka Paeng’s very first day as Secretary just to show us that they’re still ‘the boss.’ Pero matagal nang nawala ang takot sa amin (but they can no longer taunt us),” recalled Florida Sibayan, chairperson of the Alyansa ng mga Manggagawang-Bukid sa Asyenda Luisita (AMBALA). The new DAR Secretary, Rafael Mariano, immediately issued Memorandum No. 1 which in effect stopped the eviction of long-time tillers and destruction of their crops in disputed areas. “Now we have a DAR Secretary from our own ranks – Ka Paeng knows how hard it is to toil in the fields,” Apong Dina said, referring to militant peasant leader Rafael Mariano, who is now at the helm of the DAR. “After Ka Paeng issued that memo, we started planting again. Now we are about to harvest palay,” said Apong Dina. Sibayan agrees: “We are glad to have a Ka Paeng (at the DAR), but we know our struggle is not yet over,” she said. Thousands of jubilant farmworkers prepared a warm welcome for Mariano, who returned to Hacienda Luisita today to personally talk with farmers regarding their current situation. Mariano’s visit is highly anticipated by the community since his team is expected to inspect the status of land reform areas – including still disputed landholdings owned by Cojuangco-Aquino affiliate companies in different Luisita barangays. These firms include the Luisita Land, Corp. (formerly Luisita Realty Corporation), Central Azucarera de Tarlac (CAT) and the controversial RCBC property. Meanwhile, Mariano’s pro-peasant moves as DAR chief were lauded by Sibayan and farmworkers’ under AMBALA and the national agriworkers center, Unyon ng mga Manggagawa sa Agrikultura (UMA). “We have seen significant changes within Ka Paeng’s first 100 days at the DAR,” said Sibayan. As peasant leader, Mariano fiercely criticized bogus land reform schemes pushed by the Cojuangco-Aquino family, such as Cory’s stock distribution option (SDO) and the “tambiolo land reform” implemented by former President BS Aquino through the previous DAR administration. “Ka Paeng must go after these land reform saboteurs, especially since some of the brokers of this illicit leaseback scheme are reported to be lurking within the local DAR offices or have availed of government funds and projects because of their links to former President Aquino,” said Ramos. Ramos also said that Luisita farmers should not let their guard down “even if we have staunch supporters like Ka Paeng in the Duterte administration.” Mariano recently junked a plea from Cojuangco-Aquino firm TADECO, upholding an earlier DAR decision to cover some 358 hectares of prime agricultural lots for land reform. Luisita farmers continue to campaign for the enactment of a new land reform law to effect their demand for free and distribution – a demand that can never be granted under onerous amortization requisites stipulated in the bogus CARP. Mariano, who authored the earlier version of the bill as Anakpawis representative, continues to be one with farmers in pushing for the Genuine Agrarian Reform Bill (GARB), now filed as House Bill 555. UMA also stressed that agriworkers in Luisita and the rest of the country strongly support the second round of peace talks between the Duterte administration and the National Democratic Front (NDF) scheduled next week. The negotiations will tackle socio-economic reforms including land reform. “Now that peace talks are ongoing between the government and the NDF, paramilitary detachments and army headquarters in Hacienda Luisita must immediately be dismantled. We call for the immediate pull-out of these troops for our farmers to finally till their land in peace,” said Ramos. Farmworkers and the whole community are also preparing for the commemoration of the 12th anniversary of the Hacienda Luisita massacre on November 16. Luisita farmers led by AMBALA-UMA stage a picket in front of the Office of the Ombudsman August 2014, as survivors file a motion to reopen the case against massacre perpetrators including Gen. Ricardo Visaya, Gen. Gregorio Catapang and President BS Aquino. The motion was immediately junked. Farmworkers slammed Lt. Gen. Ricardo Visaya for his desperate ploy to wash his hands of responsibility in the Hacienda Luisita massacre so as to stay as top contender as chief of Armed Forces of the Philippines (AFP) under the administration of incoming President Rodrigo Duterte. Unyon ng mga Manggagawa sa Agrikultura (UMA) Secretary General Danilo Ramos said that Gen. Visaya is resorting to blatant lies to clear his name. Visaya was quoted in news reports denying his infantry unit’s (69th IB) role in the dispersal operations which killed seven farmworkers and wounded hundreds more. Visaya outrageously claimed that he was never investigated nor charged in connection with the incident. UMA said that it is of public knowledge that the PNP’s CIDG and the NBI submitted investigative reports which recounted then Col. Visaya’s role in the Nov. 16, 2004 massacre. “We would like to remind Gen. Visaya that he was among the respondents in the January 2005 complaint filed at the Office of the Ombudsman by more than 50 survivors of the Luisita massacre. Outgoing President BS Aquino, Gen. Visaya, and retired Gen. Catapang, whom BS Aquino shamelessly appointed as AFP Chief during his administration, were among those charged with multiple murder, multiple frustrated murder, multiple attempted murder, physical injuries, malicious mischief, theft, grave abuse of authority, and conduct unbecoming of a public official,” said Ramos. UMA reiterated that the complaints were actually “killed” twice during BS Aquino’s reign. Complaints against the police and military were dropped shortly after Aquino held power in 2010, while the survivors’ motion to reopen the case in 2014 was immediately junked. Survivors lament that the case was dismissed based solely on NBI reports, which ironically stated that there is basis to file charges against erring officials and that the testimonies of the survivors and protesters were more credible than that of the involved government personnel. The farmers’ complaints were junked without any other effort to conduct hearings or a more thorough investigation. Furthermore, in a sworn statement made by respondent Capt. Gerry Pingen, which appeared in the NBI report, he described then Col. Visaya’s role during the massacre. In particular, he mentioned that Visaya through his cell phone ordered him to position the combat vehicles at the right side of the compound, fronting the gate. Visaya and Catapang are known to be the commanders of military units which opened fire at the unarmed protesters during the bloody dispersal. Farmers vow to revive their complaints as they hope that the incoming Duterte administration would be keen in dispensing justice for the victims of the massacre and other crimes committed thereafter such as the string of extra-judicial killings and the recent atrocities by the BS Aquino regime, including bulldozing of crops, burning of huts, physical injuries and illegal arrests. Agricultural workers under the national federation Unyon ng mga Manggagawa sa Agrikultura (UMA) added their voices to human rights defenders urging President-elect Rodrigo Duterte to drop Gen. Ricardo Visaya from the shortlist as new chief of the Armed Forces of the Philippines (AFP). “Visaya deserves to be in jail with Aquino,” said UMA Secretary General Danilo “Ka Daning” Ramos. Visaya was ground commander of the 69th Infantry Battalion involved in Hacienda Luisita massacre of November 16, 2004. At least seven farmworkers were killed and hundreds more were injured in the violent dispersal of striking farmworkers, widely-believed to be ordered by President Benigno Aquino III and his family. Aquino was then a Congressman of Tarlac and active administrator of the controversial sugar estate. Gen. Visaya is also notorious as the “right hand man” and “protégé” of Ret. Maj. Gen. Jovito Palparan’s in the reign of terror in Central Luzon which claimed the lives of seven more supporters of Luisita farmers, including Tarlac City Councilor Abel Ladera, Father William Tadena and Bishop Alberto Ramento of the Iglesia Filipina Independiente. Visaya is also implicated in lumad killings and harassment of agricultural workers and unionists in Mindanao. After Luisita, Visaya’s infamous army unit was also involved in the massacre of lumads in Paquibato, Davao City in June last year. Visaya also headed the 27th IBPA in Polomolok, South Cotabato which perpetrated harassment against farmworkers of Dole Phils. during a union election in 2011, targeting leaders of the incumbent union affiliated with the Kilusang Mayo Uno. The 2005 Ombudsman case filed by 52 survivors against perpetrators of the Hacienda Luisita massacre was “killed” twice during the BS Aquino administration. Immediately after BS Aquino held power in 2010, charges were dropped against police and military personnel including Visaya and retired Gen. Gregorio Catapang, whom Aquino later appointed as AFP Chief. Ten years after the massacre, in 2014, survivors moved to reopen the case, but this was also immediately junked by the Office of the Ombudsman. 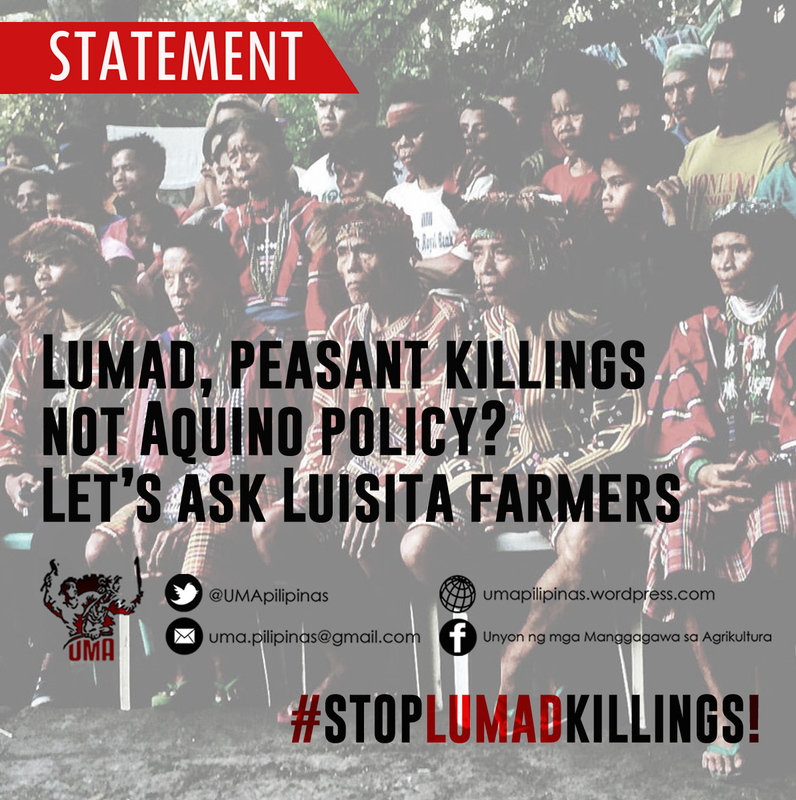 Luisita farmers also seek justice for recent rights violations perpetrated by the BS Aquino regime such as bulldozing of crops, burning of huts, physical assault and illegal arrests. Hundreds of complaints filed by farmers in 2014 are yet to be acted upon by the Department of Justice. “Visaya and his men are murderers who prey on the poorest of the poor to favor the landed elite and the oligarchs. The people are truly counting on Mayor Duterte to make good on his promise to dispense justice and curb crime. As the incoming Commander-in-Chief, Duterte must not allow notorious criminals like Visaya to be at the helm of the country’s armed forces,” said Ramos. MANILA, Philippines – On the 30th anniversary of the People Power or the February 25, 1986 ouster of the Marcos dictatorship, the Anakpawis Party-list said that the two Cojuangco-Aquino presidents, Corazon “Cory” Cojuangco-Aquino and his son the incumbent president, Benigno Simeon “Noynoy” Aquino III, are among those to be blamed for the continuing betrayal of the spirit of “democracy” and “freedom” from authoritarian rule. “The two Cojuangco-Aquino presidents, ruling the country for almost 12 years, and the intervening regimes of three other presidents, have in fact continued the Marcosian legacy of condemning majority of Filipinos, namely, the farmers and workers to live in unthinkable poverty and misery,” Anakpawis Representative Fernando “Ka Pando” Hicap said who joined the protest at EDSA led by Bagong Alyansang Makabayan (Bayan). Anakpawis said that the administration of the late president Cory Aquino authorized “Mendiola Massacre” on January 22, 1987 that resulted the killing of 13 farmers. There were about 30,000 farmers and protesters who marched towards Mendiola Bridge in Manila but were met by an armed-to-the teeth contingent of government forces who opened fire at the mob. The rally was led by Kilusang Magbubukid ng Pilipinas (KMP) who was demanding what Aquino has promised, agrarian reform. On January 16, 1986, Cory Aquino promised that “land-to-the-tiller must become a reality instead of an empty slogan. “Agrarian reform is clearly a democratic agenda as majority among Filipinos are farmers, and it only took a year for Cory Aquino to totally demolish that hope, the farmers to own the land they till,” Hicap said. To try to make it appear that she was true to her promise, she pushed for the enactment of Republic Act No. 6657 or the Comprehensive Agrarian Reform Program (CARP) which became a law on June 10, 1988. On the said law’s expiration on June 30, 2014 or 26 years and two extension later, CARP did not however come even near the fulfilment of her “land-to-the-tiller” campaign pledge. “The whole world knows that farm workers in Hacienda Luisita were massacred and the Cojuangco-Aquino family still keeps control over vast lands at present,” Hicap said. Anakpawis said that the Cory Aquino administration enacted laws that are detrimental to both Filipino farmers and workers and that played a crucial role in the Hacienda Luisita massacre. A day before CARP was enacted, the Aquino regime enacted Republic Act No. 6727 or the Wage Rationalization Act, while months before on March 2, 1989, the Republic Act No. 6715 or “Herrera Law.” Anakpawis said that the Herrera Law introduced the “assumption of jurisdiction” power of the labor secretary, and its power to promote the hiring of contractuals and other non-regular workers. Assumption of jurisdiction is usually invoked by the labor secretary to break up the legitimate strikes launched by workers in the country such as it was used prior to the November 16, 2004 Hacienda Luisita Massacre violent dispersal. “Cory Aquino’s presidency betrayed the Filipino workers by breaking up the wage levels among regions and promotion of contractualization, which both landmark laws attacked the legitimate rights of workers for wages and form unions,” Hicap said. On the part of the young Aquino, Anakpawis was aware even before his presidency that agrarian reform was ill-fated. On February 9, 2010, during his campaign, he vowed distribution of Hacienda Luisita by 2014 with his spokesperson Edwin Lacierda announcing “it’s not just a campaign promise, it’s a matter of principle.” At present nearing the end of his term, though the Supreme Court ruled for the revocation of the stock distribution option (sdo) plan and ordered the distribution of the lands to the Hacienda Luisita farmers, they continue to fight off land grabbing by Tarlac Dev’t Corp. (Tadeco) owned by the Cojuangco family, harassment and displacement. “The Cojuangcos conned the Hacienda Luisita farmers twice, during Cory’s time and at present,” Hicap said. With CARP’s expiration on June 30, 2014, the Aquino administration has left the agrarian reform agenda in limbo, with no existing laws for land acquisition and distribution. Anakpawis is pushing for House Bill No. 252 or the Genuine Agrarian Reform Bill (GARB) that promotes free distribution of lands to farmers. Aquino has also ignored the legitimate demand of Filipino workers for P125 wage hike, across the regional boards and nationwide, encoined by House Bill No. 253 filed by Anakpawis’ Hicap and Makabayan bloc lawmakers. Instead, he implemented the Department Order 18-A, that aggravated contractualization in November 2011 and the two-tiered wage system in October 2012. Aside from major policies, Aquino’s flagship Public-Private Partnership (PPP) program has instigated systematic and wholesale land grabbing and displacement of farmers, retrenchment of workers, as well as demolitions of urban poor communities. The two presidents are also guilty of reigning authoritarian rule. Cory Aquino has unsheathed her “Total War” Policy under Operational Plan (Oplan) Lambat Bitag (Net trap), while the young Aquino has his counter-insurgency program Oplan Bayanihan. Anakpawis said that the two Aquino family members had zero-ounce of libertarian tendencies of Senator Benigno “Ninoy” Aquino. During Marcos’ 14 years of dictatorial rule, it resulted the arbitrary arrest and detention of around 120,000 people; extra-judicial killings of 1,500 activists; and the enforced disappearance of 769 individuals, according to the alternative media site Bulatlat. Under the regime of Corazon Aquino, 1,064 were victimized of extra-judicial killings, 816 of forced disappearances, 1.2 million of forced evacuation due to militarization, 20,523 of illegal arrests and detention, and 135 cases of massacres, also according to Bulatlat. The matron Aquino’s regime is known of the formation of the Citizens Armed Forces Geographical Unit (Cafgu) and other para-military units that wreaked havoc in the countryside. Under the present administration, as of September 2015, 294 has been victims of extra-judicial killings, 28 of enforced disappearances, 318 of frustrated killing, 3,237 of illegal arrests, 63,824 of forced evacuation, 161,552 of harassment, intimidation and threat, 29,257 of coercion of civilians to be guide to military operations, 182,389 of military occupation of civilian establishments and others, according to human rights group Karapatan. “The Cojuangco-Aquinos, who are great pretenders of being icons of democracy is of the same caliber as Marcos in terms of ruling with state terrorism,” Hicap said. Anakpawis also assailed the Aquino regime for the latest assault on Lumad evacuees in Mindanao, the arson of the evacuation camp inside the United Church of Christ of the Philippines (UCCP) Haran compound. Anakpawis urged various sectors to live by the true meaning of the People Power uprising by dispelling the notion that it was about the “clash of clans” of Marcos and Aquino, but instead Marcos against the Filipino people. “We should learn by now, after three decades that neither Cory Aquino, nor Ninoy Aquino was the main determining factor of People Power; it was the will of the Filipino people to overthrow Marcos’ dictatorship,” Hicap said. Hicap reminded that anti-people rule of post-People Power administrations that never realized fundamental reforms such as genuine agrarian reform, nationalist industrialization, wage hike, respect for human rights and more, is suggestive that choosing national leaders should not be among the ruling cliques or camps, but of leaders who were actually with the people’s struggle. “We are here commemorating People Power and amused by the show of newly acquired air force arsenals, but we are positive that it would not even get into action against a foreign power, but would be used against Filipinos, such as what took place during Cory’s time in Marag valley,” Hicap said. Today, we mark the 11th year of the massacre at Hacienda Luisita which killed seven people and wounded hundreds. No one has been jailed over this gruesome crime, eleven years hence. Luisita’s lands, which the farm workers have demanded for, remain firmly in the hands of the Cojuangco-Aquino family. This, despite the justness of distributing the lands to farmworkers and a Supreme Court decision ordering the distribution. The Hacienda Luisita massacre was carried out in order to attack and end the farm workers’ strike, which was caused by extremely low wages in the hacienda’s sugar mill. As of late, it is the most brutal incident of trade-union repression in the Philippines and among the most savage cases of violence against farm workers in the world. We mark the 11th anniversary of the Hacienda Luisita massacre just a few days before the country hosts the Asia-Pacific Economic Cooperation Summit. Trade-union repression and other forms of attacks on workers’ rights are central to the APEC, whose thrust is to further increase the profits of the biggest capitalists in the world and the Philippines to the detriment of workers, the poor and the environment. The best way to pay tribute to the martyrs of Luisita is to continue their struggle for a better world for workers against big foreign and local capitalists and their instruments like the APEC. APEC 2015’s rhetoric of “investing in human capital” is all about producing cheap, semi-skilled and repressed labor from underdeveloped countries like the Philippines. It will intensify APEC’s long-standing policy of pressing down wages, promoting contractual employment, violating workers’ rights to form unions and hold strikes, and removing all regulations that protect workers, including those on workplace safety. We are calling on all workers and all Filipinos to join protests in time for the APEC Summit. Let us show our condemnation of APEC’s existing anti-worker, anti-people and anti-environment policies. Let us show our opposition of the policies which APEC 2015 seeks to approve and impose on the workers and peoples of the world. Responding to a reporter’s query on the spate of killings of indigenous peoples or lumads in Mindanao, BS Aquino nonchalantly said: “There is no campaign to kill anybody in this country.” What to expect from a haciendero president who is himself culpable for the gruesome massacre of farmworkers in their own backyard, Hacienda Luisita, more than ten years ago? What’s happening in peasant and lumad communities infinitely speaks louder than Aquino’s incoherent ramblings. It is shocking that Aquino still has the temerity to speak of his government serving the people, while his regime is awfully busy pandering to insatiable business interests of private enterprises, giant multinational firms and his landlord kind in Hacienda Luisita, in Mindanao, and all other spots in the country coveted by plunderers. The Unyon ng mga Manggagawa sa Agrikultura (UMA), its local affiliates and the vast number of agricultural workers specially those toiling for plantations in Mindanao, stand in solidarity with the lumads and vow to fight state-sponsored attacks against our land and life. It is not only foreign large-scale mining firms which have encroached on ancestral lands of indigenous peoples but also giant agricorporations which are now geared toward aggressive expansion of export crop plantations in Mindanao. Aquino may say that outright killing is not his policy, but he is unmistakably zealous in promoting and implementing neoliberal policies and hosting imperialist charades such as the Obama visit and the Asia Pacific Economic Cooperation (APEC) meetings culminating in November. Aquino is fully aware that disastrous economic prescriptions imposed by imperialist globalization have been slowly killing Filipino workers and peasants. The same Stock Distribution Option (SDO) mode of “land reform” already exposed and revoked in Hacienda Luisita, and several other mutations of this flawed non-land transfer scheme, is still in effect in vast haciendas and plantations victimizing millions of peasants. These Agribusiness Venture Arrangements (AVAs) allow for the reconcentration of lands back to big landlords and the furious intrusion of giant multinational plantations into peasant communities and ancestral domain of lumads. According to Anakpawis Partylist, peasants comprise an alarming majority – 198 out of 229 – of the victims of extrajudicial killings (EJK) under Aquino. Of these peasant EJK victims, 55 are lumads. Before the recent killings of Manobo leader Dionel Campos, Bello Sinzo and Emerito Samarca of the Alcadev lumad school in Surigao del Sur, or of the massacre of five Manobos in Pangantucan, Bukidnon – there was Gilbert Paborada, the Higaonon leader who was killed in 2012 to make way for ABERDI oil palm plantations in Opol, Misamis Oriental. Marcel Lambon, another Higaonon leader of Impasug-ong, Bukidnon was gunned down by paramilitary forces in 2014 also because of his stance against oil palm expansion. Earlier this year, Tata Biato of the Manobo-Pulangihons organization Tindoga, was shot dead by goons of the Rancho Montalvan firm of the Lorenzos. Two other lumads, who were with Biato to attend to their bungkalan or land cultivation area, were wounded. Organized peasants and agricultural workers, some of them also lumads, are targets of killings and harassment related to agrarian disputes and trade union repression. There is indeed “a campaign to go after criminals,” Aquino says. In the Philippine countryside, it is a perpetual counter-insurgency drive now recycled as Aquino’s Oplan Bayanihan. Is this the reason why the 69th Infantry Battalion of the Armed Forces of the Philippines – perpetrators of the massacre of lumads in Paquibato District, Davao City only last June – is the same army unit responsible for the massacre of farmworkers in Hacienda Luisita more than ten years ago? Is it mere coincidence that Gen. Ricardo Visaya – implicated in several cases of lumad killings and harassment of agricultural workers in Dole’s pineapple plantations in Mindanao – was also the ground commander responsible for the carnage at the sugar workers’ picket line in front of the gates of the Cojuangco-Aquinos’s Central Azucarera de Tarlac in 2004? What is this alarming spate of killings but a war for plunder, a campaign to silence dissent and usher in the pillagers? Is it not Aquino’s policy to kill those “unruly” lumads and peasants who get in his way? Why not ask us Luisita farmworkers?